This is a belated but welcome translation by publisher Viz Media of the original Japanese artbook The Art of The Princess Mononoke—もののけ姫. Princess Mononoke and and the accompanying artbook came out in 1997. By the way, that Japanese artbook is still being reprinted even after so many years. I've reviewed the original Japanese artbook before, and also the other English edition by Miramax Books. There's no point getting those books now because one's in Japanese and the other is out of print. Viz Media's books are widely available. The interior pages of this English edition is laid out exactly the same as the Japanese book, only the text have been replaced. One other difference is this book is a hardcover vs the textured dust jacket paperback Japanese edition. This 224-page hardcover has well reproduced pictures on low to no gloss paper. Very good. The book starts off with a few poems and an introduction by Hayao Miyazaki before it goes into the concept art. The concept art is a mixture of character designs, movie stills, environment art, storyboards and several computer animation screenshots. There are line drawings as well as the pencil and watercolour sketches of Hayao Miyazaki. There aren't many studios that still use watercolour sketches to create concept art nowadays so it's always refreshing to see the ones from Studio Ghibli. The sketches may look loose but they convey the action and settings clearly, and they look charming. The environment art are by Kazuo Oga and some of his artworks have also appeared in 男鹿和雄画集II (Oga Kazuo Animation Artworks 2). There are a lot of background paintings and not one of them are credited so it's impossible to tell if they are all from Kazuo Oga. Towards the back are three tutorials that look at how the film is made, such as the use of computers for compositing, colouring and backgrounds. That's followed by selected storyboards. Finally there's a 3-year production diary that records down the milestones and activities. Even things like Hayao Miyazaki going for his acupuncture sessions are also recorded. Amusing. Just like other Studio Ghibli artbooks, this is a wonderful companion to the film. 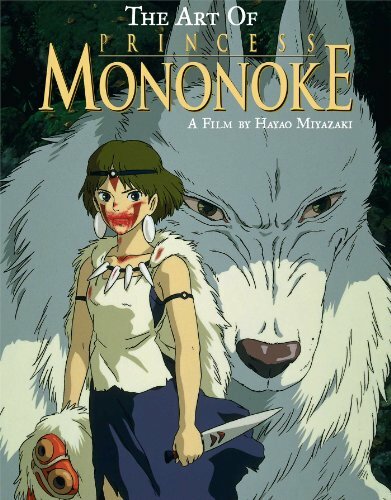 Highly recommended to fans of Princess Mononoke and Studio Ghibli.